Posting resumes on 11 April. See you then! 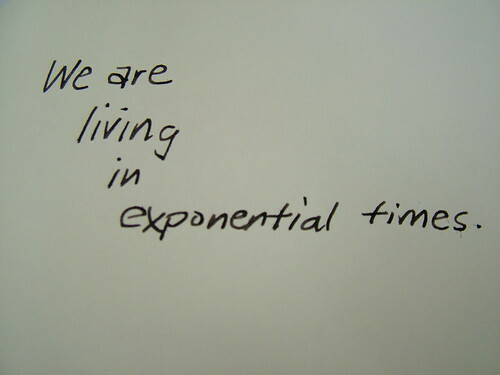 We really are. The trick is figuring out which ones matter. Photo by topgold on Flickr. More telling, at least in hindsight, was this part. The analysis is mine, direct from the book. What’s interesting about that comment – apart from how well it illustrates Ballmer’s gadfly salesman’s mind flitting about the subject in search of a compelling way to persuade people to buy an integrated device that could make phone calls and play music – is its lack of technological foresight. First, that “most people would carry a phone with a ‘little hard disk”’. Apple had already bought up supplies of solid-state Flash memory for an iPod with no moving parts, and when meeting me four years earlier Hase had introduced the idea of a 1-gigabyte Flash chip – enough to hold about 250 music tracks. The Motorola phone being co-developed with Apple would store its songs in Flash memory; and any technologist knew that prices for Flash storage were, like those for hard drive storage, halving every year. Second, the idea of the explosion of larger keyboard devices is classically short-term thinking that also ignores the relentless march of processing power. Although touch computing was still mainly in the laboratory, it was already conceivable: Nokia had that year built a prototype touch screen phone, and a small company called Fingerworks had been working between 2001 and 2005 on “multi-touch” systems for screens, and making presentations at conferences. A technologist – an engineer – keyed into the industry’s future would have known of it and seen its direction. Very few companies are able to envision what the future will look like. Steven B Johnson wrote about the importance of “adjacent technologies” for innovation and invention: that before you can make one technological leap, you need to have all the technologies available that will let you do that. But you also have to have people who can see how the landscape will look when you fast forward five, seven, ten years. It’s not just Moore’s Law, with its constant doubling; it’s also the pricing and availability of other technologies such as screens, batteries, sensors, and their integration with existing materials. The 2007 iPhone was unimaginable to almost anyone in 2002; by 2012, there was a feeling that it was old hat, and the shift towards wearables was already in full swing (the Pebble first appeared in 2012). So which companies are good at doing this? Having covered the technology space for decades, there are still only two companies which in my view reliably spot the future and move towards it, and shape themselves and their products to line up with it. The first: Google. Larry Page and Sergey Brin have proven, again and again, that they can see what’s coming around the corner, and position themselves (and their company) for it. Internet search? Minor problem in 1996, when they started on it. But they could follow the growth, and see the oncoming problem: a bazillion sites and no proper index. Fast forward to 2005: while Eric Schmidt is busy chief executive-ing, Page and Brin investigated and bought a small mobile startup called “Android”. They didn’t even refer the purchase to Schmidt. They did it because they could see that the mobile internet would be the future, and that they had to be part of it with their own mobile platform; Android was a protective measure against Microsoft cornering the smartphone market and potentially locking out Google search. There are tons more examples at Google, though many of them are still in the ferment of development; we don’t know if they’ll be farsighted or just overambitious when we look back in five years’ time. Ultimately, though, Apple executives didn’t consider any of those features compelling enough to enter the highly competitive television market. The sensor-equipped cameras sounds like Apple was trying to make use of technology acquired from PrimeSense in November 2013. At the time, I thought that the amount spent pointed to Apple wanting to put the technology into a product within a year – as had happened with Authentec (fingerprint unlock) and Anobit (SSD technology). We know what the original Kinect could do: it could detect faces, movements, people and map them all in 3D space. So what is Apple interested in doing around that? Now you know: it wanted it for a TV. But the use case wasn’t compelling. Waving at your TV is not, apparently, the future. You might be wondering where Microsoft is on this list, and Facebook, and a multitude of others. Microsoft – well, it hasn’t been able to overcome the contradictions of its own strategy taxes to be able to embrace the future and tear down its past. (Satya Nadella is doing that now, to some extent, but it’s long overdue.) Look again at that extract from my book at the top. Ballmer shows no sign of understanding what was coming, of how quickly the deluge would overwhelm the space. The Zune (2006) used a spinning hard drive, fer Crissake, when the iPod nano (SSD) had come out in September 2005. That’s the other part of seeing the future: being able to let go of the past. Apple and Google have been able to shrug and say “OK, on to the next thing” in many cases, and let their old products die. Google search doesn’t die, of course, but that’s because it’s still an essential task for many. Equally, Google has been happy to cull products when they don’t fit the future it’s expecting. Facebook hasn’t had enough time to show us what and how it can shape the future, and also I think that its reluctance to embrace hardware (understandably) also means that it’s reliant on others to lead the way. That would be Apple and Google, though, especially through mobile, where Google’s Android is driving the evolution of all sorts of adjacent industries to the smartphone (camera optics, GPS chips, batteries) and Apple is showing what really effective user interfaces and experiences feel like (the Watch is a giant leap, but one where you don’t realise that the ground has moved underneath you). I’d love to know which other companies have shown that they can spot the future, and pivot themselves towards it repeatedly. Sure, Dropbox and Box foresaw storage being free; but what else have they seen? What are the other enterprises that have regrouped themselves and solved a problem that was coming our way five years ago, or are solving a problem coming our way in five years’ time? Do tell me your thoughts. Photo by Alessio Jacona. Licensed under Creative Commons. Possibly he has kicked a cat at some point too, which would never do. The very fact that a middling executive could be brought on for a turnaround of Nokia, and compete with the iPhone/Android onslaught with absolutely zero turnaround experience was one of those decisions that has confounded me and I continue to blame the Nokia board for shooting itself in the head. On his watch, Nokia essentially eviscerated. Android might have been a better decision, but he went with Windows Mobile. The stock tanked, market share shrank and like proverbial Lord Mountbatten he was part of the last days of the Nokia Raj. Let’s set the scene first. Nokia ruled the smartphone business in 2009, but that business was tiny compared to what it is now. More important, the ground was shifting under Nokia’s feet. The arrival of the iPhone, and more importantly Android, and – more importantly than both – of their respective app stores meant that the whole smartphone game was changing. Nokia didn’t have capacitative multi-touch, and didn’t grasp the potential for “a computer in your pocket”, even at the iPhone’s high price. So by mid-2010 Nokia was in deep trouble, which many of its board had realised for some time. That’s why they sacked their then chief executive and headhunted a new one. 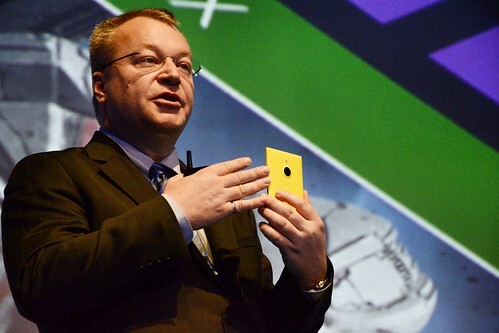 Stories have emerged that Elop was their second choice – after an unnamed American exec at a big company (Tim Cook?). What were Elop’s choices? In order: stick with Symbian; go with Maemo; go with Android; fork Android; go with Windows Phone; try to license something else. • Symbian was already a dead dog (see my review of its flagship N8). • Maemo simply wasn’t ready, and would have had to try to build an ecosystem from scratch with virtually no developer support – which Nokia would be unlikely to mobilise on its own. “I’m very happy with the decision we made,” he said. “What we were worried about a couple of years ago was the very high risk that one hardware manufacturer could come to dominate Android. We had a suspicion of who it might be, because of the resources available, the vertical integration, and we were respectful of the fact that we were quite late in making that decision. Many others were in that space already. Of course, the manufacturer was (and is, for now) Samsung, which the advantage of component manufacture. I believe Elop was also tipped off by then-CEO Steve Ballmer that Microsoft would begin patent lawsuits against Android manufacturers to generate revenue and raise their costs, and hence make Windows Phone no less attractive. • Forked Android. I’m unsure whether Elop looked at the idea of forking Android (that is, using AOSP and adding a la carte services). Nokia had a map company; for search it could have gone to Microsoft, which was (still is) desperate to get mobile search share for Bing; and then it could have looked around for other providers for other services. The big question in such a scenario would be apps, of course, and the question of what Google might do with the Android code that made up AOSP in the future. But I don’t think such considerations occupied peoples’ minds very much. Smartphone sales in China were still a tiny business, comparatively, because they hadn’t quite achieved economies of scale. I think that the “what if Nokia had picked up AOSP?” question is the really interesting one – so if anyone knows if that option was examined (I forgot to ask it of Elop) then do get in touch. Now he’s back at Microsoft, Elop is chopping tons of jobs. I wonder if this is entirely his idea. Ballmer very much wanted to buy Nokia’s mobile business; Elop would have been keen to sell. But I think Satya Nadella is shifting Microsoft away from devices towards services, and towards platforms. That, however, is why I find the killing off of the Nokia X puzzling. It’s “Nokia on forked/AOSP Android”. I’ve previously said that Microsoft should just give up on Windows Phone, and adopt AOSP, because it has all the pieces in place. Nokia actually did do that – but now it’s dead. This just makes no sense. If Microsoft is a platform company (as evidenced by Nadella’s first public performance being to unveil Office for iPad, then it should be building and enabling platforms. Further, the desktop/laptop installed base is smaller than the smartphone installed base (about 1.5bn v 2bn), meaning that Apple has a (slightly) bigger share there. Windows Phone is not a success. Android, however, is a success. And tons of Chinese companies have made AOSP a success – using it to build platforms where they offer search and maps (Baidu) and e-commerce (WeChat etc). Lots of developers are comfortable writing apps for AOSP and Android. Microsoft though is ditching Nokia X (which phones will be sidegraded to Windows Phone – that’s going to be interesting for the users) – abandoning the chance to build its own native platform and exploit Google’s power in the market to hoist itself upwards. Instead, it’s going to plough on with Windows Phone. That’s hopeless. Windows Phone has no USP. Consider: BlackBerry has its enterprise-grade security. (Governments and defenceniks still love it.) The iPhone has the Apple brand and user experience. Android has any size, shape and price you want. Windows Phone has… no native YouTube app? Fewer apps overall? It lacks many of the enterprise features that iOS 7 has (and that will increase when iOS 8 arrives), so what is the reason for getting it? I really don’t know what Microsoft’s mobile strategy is any more. It’s clearly making the same mistake it keeps making: trying to fight people on the ground where they’re strongest. That worked once – over browsers. But Microsoft had a big advantage then: it had Windows. If browsers had been a “fair” fight, who knows if Netscape or Internet Explorer would have won. In search, Microsoft tried to take on Google head-on, five years late, playing catch-up on basic technology and infrastructure, instead of finding other ways to exploit search. Google keeps diverting rivers – Chromebooks have forced Windows licence prices down; Google Docs has forced cuts in the price of Office; ad-supported email has destroyed the paid-for Hotmail model (it used to exist, honest). Google diverts rivers. But Microsoft can’t see a city – mobile, search, browsing – without wanting to lay siege to it. Mobile is just more of the same – and just when it looked like it had a chance to make the water flow the way it wanted with the Nokia X, Microsoft is killing it. Don’t expect things to improve. Maybe someone though could ask Stephen Elop if he ever considered whether Nokia could have forked Android (or built on AOSP) rather than going with Windows Phone.